Our caring team place utmost importance on your oral health and wellbeing, which is why we offer a range of high-quality, general dental services. Just one of these includes dental extractions, allowing us to ease a patient’s pain or discomfort when a tooth can no longer be saved with other procedures. When Does a Tooth Require Removal? Before you make the decision to have an extraction, we’ll talk you through the alternatives to help you make up your mind. 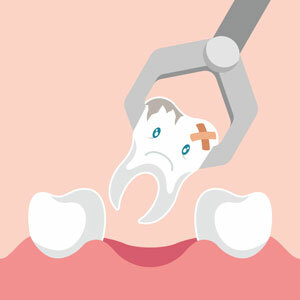 We’ll also discuss tooth replacement options with you once you’re on the road to recovery. Simple tooth extractions can be done right here in our Oakleigh practice. To begin, our oral health care professional will apply a local anaesthetic to thoroughly numb the area and prevent you from feeling any pain. Then they will loosen the tooth and extract it. Sometimes the gum may require a few stitches before gauze is packed into the empty socket. The gauze helps a blood clot to form over the extraction site, which is vital for preventing a painful complication known as ‘dry socket’. Our local anaesthetic will prevent you from feeling pain during the procedure, but once the extraction has occurred and your gum is healing, you may begin to experience discomfort. Your dentist will advise you about which painkillers may be used in the first day or two; however, after this time you should feel much better. Are you experiencing dental pain, sensitivity, or discomfort? Please schedule a consultation with our professional team so we can treat your concern sooner, rather than later.